Work for Altaro VM Backup? Learning about Altaro VM Backup? "Altaro VM Backup is simple and powerful"
Altaro VM Backup is simple to use. It upgrades without and problems and has never failed me in actual and test Disaster Recoveries. It doesn't require much background services like SQL which many competitor backup software does. And the price is very affordable for my small business clients. Nothing not to like. Altaro VM Backup is simple to use. So simple that the first time that I used it several years ago, I thought that it couldn't possibly be as effective as it proved. The trial had me sold. At least 5 years on and a few upgrades later, my opinion hasn't changed. Definitely great for small businesses. I have not used it in an Enterprise class scenario so cannot say. Works wonders in a situation with 4 to 5 Windows Hosts (2012 R2 and 2016) with around 6 VMs each. The tech support is very impressive the few times I have had to call on them. Very knowledgable. Testing VM recovery is a breeze. Great for peace of mind. Never failed me yet. "A must for HyperV backups!" The multiple backups options available. To be able to backup to remote out of office locations and local NAS is a must. Ability to restore very easily a whole system or just a few files. I can't think of anything. Possibly if there were a third backup location option. I always like to have more than one backup type running just in case one fails, you have an alternate going. If you are using anything else, give Altaro a fair test. It is well worth the money and the only product I will use. There are too many great options available. Just plain works great. I am able to backup to multiple locations, even offsite locations out of office. Email notifications. Now Replication options. Very stable. "Asome, Great, easy to use !!" Easy to use a lets you know if there are any problems with backups. Cant think of anything, i really like this program. very easy to use and set up and it lets you know if there are any missed backups. easy to see our customer backup status ! "Altaro VM Backup is very professional application. It is the best for me." I would like to say that Altaro has very frendly panel to manage. It is very intuitive. I used a lot of appliaction to backup but the Altaro is very professional and still develops. At the moment I do'nt have any negative arguments. Officially I use this appliaciton for backup our of virtual machines. "Cost efficient and do the work"
Easy to operate with intuitive interface. You can't find other tools so useful at this price. There is nothing to complain about. I am waiting they launch new function to backup physical server. Download trial license to test, you may easily find it's right backup solution for your virtualization environment. I actually had one host server crashed and the backup data by Altaro did save my life. It successfully restored and up running in just couple 10 minutes. It's very easy to use and the interface is logcially laid out. It's not the prettiest UI but very functional. Having built-in support right in the UI is great. Just being able to do image-based backups of my virtual machines has been a great relief. It's something I don't need to worry about anymore. "One of the must haves on a VM system"
I love the fact that it's saved my a**e several times since 2015 when I started using it! Previously my SMB customers would run with the built in MS backup solution that left me as IT Admin feeling a little vulnerable, but now I sleep better! The main features I love are the compression and duplication which means I can get more backup history on my existing storage. I also love the Offsite Server and we use this at multi-site customers over normal FTTC lines very well. This saves having to have an unreliable staff member swap over USB drives (which doesn't happen more often than not) and take offsite, and with the encryption we know it's safe. Lastly on the unlimited edition the brick level Exchange restore has also proved useful. Oh, when I have used support they have been fairly well clued up on the product and have given great help! I have to note that they also have some very good (and updated) articles on HyperV usage etc online and often when just Googling a HyperV problem it will come up with the solution within an Altaro web article. The fairly large prices increases since 2015, which I hope don't continue (inflation OK but the RRP of the Standard product went up 35%). The yearly maint. costs are good though, just that initial purchase can (nearly) be a deal breaker for the SMBs I deal with, on top of a new system. One gripe I had was I needed to do a mailbox restore in v7 which wouldn't work and Altaro said it would only be fixed in v8 (which at the time was weeks away), which didn't help me there and then and I had to do it the long way via Exchange Recovery, which as we had paid for Unlimited for this very reason, was a little annoying. Being a bit OCD I like to check my Encryption key but once set you cannot view again, and then at the back of my mind I keep thinking, did I set it right! Don't get me wrong though, even with these little "dislikes" I really love this software, I definitely sleep better, as I said above. Saving on version history storage with great compression and also doing offsite copies (private cloud) to take out the human factor. Being able to sandbox restore VMs for testing and update trials. Quickly recover brick level Exchange email. Many thanks for your review - we appreciate your feedback. We wanted to let you know that we actually have a feature request in the works to develop a function for testing your encryption key, and we have added your vote to this. However, as a workaround for the time being you can simply install Altaro VM Backup on another machine (no need to configure anything) and try to run a restore (instructions at http://support.altaro.com/customer/portal/articles/1977127) from your encrypted data. It will prompt you for an encryption key and will let you know if it is correct or not. Regarding pricing, this was increased to better reflect the value of the product: We have also significantly increased product functionality over the past years, while beefing up our team of experts to continue providing outstanding, personalized support. "nice and impressive backup software"
Altaro backup software has a high compressibility, additionally it is able to backup multiple clients at a time, and won't get your backup lost while the host is down. it helps backup all virtual servers with one software and could recover the server by file level and package level, to reduce RTO. Most of our error messages attempt to explain the issue in plain English as well as giving an error code that you can search online with or give to our support team. When applicable, they also supply a KB article link. If there are particular errors you are getting which are unhelpful, please report this to our support team on support@altaro.com so we can be sure to improve the messaging. I also wanted to let you know that new builds can indeed be pushed online through our cloud management console (CMC); however, this requires an Unlimited Plus edition license. In relation to the dashboard, we would love to hear more about what you would like to see there: Would you send some more detailed feedback to us on support@altaro.com and we will pass this through as a feature request? Thanks again! "Great product, could use physical server backup"
The cloud console and ability to monitor all of our backup instances is great. Replication to an off-site location as well as locally is a key feature we are utilizing. The ability to boot a VM from a backup is also a nice feature. Being able to use a few different online storage options, such as Amazon, Wasabi etc.. would be nice. Azure is working great though. The ability to backup physical servers and the VM Host itself would be a great feature for disaster recovery. To be able to backup the entire environment this way would be the last feature needed to supplant our other existing backup solutions. Full restores of VMs have saved us on multiple occasions. Also the dashboard makes monitoring the backups much easier. Many thanks indeed for your review. We appreciate your input. Altaro VM Backup does not back up the physical machine itself, only the VMs running on the host. That said, the Hyper-V Host should not have anything aside from VMs running on it so normally a one-off, or periodic backup using Windows Server Backup should be enough to cover your needs, as the data that is changing is inside the VMs themselves, which Altaro VM Backup backs up regularly. altaro is easy to setup. after first setup it runs without problems for years. restore is also easy and works very good. i would prefer a more lower price for altaro. complete and easy backup for all hyper-v servers. "Nice and Easy - The way it should be"
The product was easy to install, configure and get my first backup under my belt. I get a notification email everyday that my backsups are done.I suggested this product to a friend who manages a number of small companies IT needs and he thanked me for turning him on to Altaro. As of now, I have not found anything that I dislike about the program. It has been a mostly set it an forget it experience. There has been one warning that I can't seem to get cleared out. Altaro is an important part of our Business Continuity plan. We depend on Alrato to easily backup and restore our VMs. "Altaro VM Backup v8 Review"
The Altaro user interface is terrific, clean, uncluttered and everything is organized in a logic manner in which you would expect. We are able to replicate near real time our production web / sql server vms across the country to our Altaro servers running at our disaster recovery sites. It works great and provides us peace of mind in our investment. "Altaro back up is the best VM and offsite back up solution"
The tech support is easy and very helpful. You can set up and schedule VM back ups in minutes. You need to upgrade licence to back up to azure. One solution for multiple back up solutions in 1 easy to manage gui. "Quality Product at a Quality Price"
Fire and forget! I configure what I need it to do, and Altaro does the rest. The ability to encrypt the backups so easily is key as we are required by law to have everything encrypted. Restoration of a back up at the VM or file level is ridiculously simple. There are always improvements that can be made with a product, but currently, Altaro does everything that I need it to do. If you don't want to worry about your backups, this is the product. Simple to configure and get going. We are a non-profit, so cost is key. Altaro was able to give us what we needed, and we are very satisfied with it. It works reliably and informs about the processes. It doesn't work properly with Exchange Server. We use it to backup our virtual machines and replicate them. "Extremely useful and reliable backup tool. Simple to use and great support team!" Altaro is a very simple yet powerful tool with great flexibility to match most small to mid-sized virtual environment needs. The features we value the most are the continuous data protection, in-line deduplication, and boot from backup. Also, the backup health monitor ensures that no corrupted blocks are kept by flagging them to "self-heal" during the next backup job. Plenty of retention policy options as well, and a very visual and easy to use dashborad round up a great and mature software you can rely your data on. Moreover, we always get super fast and very professional help from the support team. We don't have a very complex infrastructure and Altaro meets all our needs. It works great for backing up or VMs but I would really love to be able to back up the host without any extra tools. We are really satisfied with this product. We use it in a Hyper-V environment and I highly recommend it. Hassle-free, bulletproof backups with minimal administration. Fast recovery options dramatically reduce downtime. Most common case scenario is the recovery of individual user files or folders which can be easily done. We alse needed to do a full recover of some virtual machines and the result was perfect, with no setbacks. The first time we had to do a full restore we contacted support to get help if necessary and they were of great help, guiding us during our first full recovery. A+ for the support team! I like its speed, simplicity, compression ratio, user UI and other useful function. It saves my time. Nothing, the product is nearly perfect. All working as desired. Everything is ok. I completely recovered our server from backup and sometimes I recover only some deleted files. This product backs everything easily and solved my problem with offsite copy. It's easy to schedule the VM's for on and offsite backups, with reports being emailed to you to make it even easier to keep tabs on what's happening. Although restores are very fast, navigating through the hierarchy to fine the file(s) you need can take longer than it should. There's a free trial - try it out first. VM's are backed up allowing for full VM restore, of file level restore. Even a single email can be recovered from exchange. "Great, easy to use backup solution"
Ease of use. Very intuetive dashboard and extremely easy to get up and running. Lack of detailed reporting. The reporting of completed backups etc along with detail from the dashboard could be far better. Backup / DR. Huge storage savings and reliable backups. Thanks for your review. Your feedback is important to us. Please send us more info about the detailed reporting you would like to see - you can contact support@altaro.com and we will gladly follow up your suggestion. Backing up organizational data and VMs. Restore then where necessary. Thank you for your review. We value your input. Please send us more info about the kind of reporting you would like to see - please contact support@altaro.com and we will gladly consider your suggestions. "Altaro VM Backup at CII"
The offsite secondary backup options help with disaster recovery, but the best thing about Altaro is the value and real dollar savings it brings over our previous VM backup solution. Better centralized management across different companies and domains. Well, the real problem was increasing needs for more hardware which virtualization helped to solve, we then needed an affordable but still full-featured backup solution, that solution is Altaro. Thanks for your kind and helpful feedback. For users with multiple hosts and/or sites, we offer centralized management and monitoring through our Cloud Management Console - check out https://www.altaro.com/vm-backup/cloud-management-console.php and contact us on info@altaro.com if you would like more info. We'd be happy to help! "Best virtualization backup software we have found." It's going to be a toss up between the simple administration of the software or the price. These two things combined make the best backup software we have tried. Very, very seldom, the program will let shadow copies run rampant causing free space issues. Give it shot. It's simple to use and easy to learn. Altaro backup enable us to create fast and effective backups of our Hyper-V environments. The largest benefit is a cost effective, simple backup solution for Hyper-V that is simple enough to not spend multiple hours training techs how to use. Thank you for your review. We appreciate your input. While shadow storage is indeed a requirement for the application to work and track changes between backup versions, Altaro has features in place to clean up shadow copies that are no longer being actively used. If you believe this is not being handled correctly, please do contact our support team on support@altaro.com to investigate further. We'd be glad to help. "We use Altaro for our Hyper-v cluster backup"
Thes ease of setup. The pricing is very competitive. And the file level restore. Just a couple of times we have had to engage supporters to help with licensing after upgrading. This has not happened in the last couple updates. We find it a solid way to restore damaged VMs. And the occasional staff member that has misplaced or ruined a file. Altaro Hyper-V backup is easy to use and implement. The latest price increase and version differences has lead my clients to ask for other options. We use Altaro for all our Hyper-V local backup deployments. We also use it for remote offsite backups. There isn't much to dislike. The software does what it needs to do. The configuration is easy and not complicated. we are ensuring that our clients backups are running nightly with Altaro software. With a quick check from an email we can see that their backups were successful both onsite and offsite. I am by no means an IT guru but this software is easy to use and manage. Users will find it to be simple to operate and require the features needed to back up modern virtual machines. There really is nothing to dislike. This software is easy to use and super reliable. It's easy, affordable, and reliable. Just do it! I have reliable backups of all of my virtual machines. This ensures that my business can keep operating no matter what happens. "Great backup solution, easy deployment, great performance"
Altaro Hyper-V Backup is a great solution to backup Virtual machines. Easy to deploy, great graphical interface, great support, and also stable performance. We use only Altaro software to back up our customers virtual servers. Maybe Altaro could be moore responsive in support. Everything else i think is good. We are solving backups in all of our company. We are using hyper v backup with offsite backup location. Backups are made fast also we are having no problem using restore. Many thanks for you feedback. We appreciate it. Our team of product experts prides itself on providing a Lightning Fast Support Call Response of under 30 seconds. Should we have not met expectations, please do let us know more about this on support@altaro.com - this will help with our goal to continue providing the outstanding support we are known for. "Best Backup Product in Years"
There is nothing to dislike so far - Altaro is just fantastic. Just give it a try :) its fantastic. We have migrated all our Customers from Acronis & veeam to Altaro. We are using Altaro since VM-Backup v4 (Altaro Hyper-V Backup) and its gets even better with every update. We can recommend this solutions to everyone who wants a fantastic Backup & Recovey solutions with fair pricing and outstanding support! "Excellent Product - Provided Huge Cost Savings!" The functionality is extremely slick, does a lot of the same functionality as its competitors, yet maintains a lower price point. We previously looked at alternatives such as Veeam, but when weighing up the two, we realised that Altaro met our needs in every way, and was significantly cheaper. Access to the cloud management is an extra cost. Previously had a poor backup procedure and replaced it with Altaro. Since then, we have eased concerns knowing all our servers and data is backed up on-site and off-site. "Does everything I need and more"
Altaro Backup does everything I need, and more, as the title implies! It would be hard to find something I dislike about it, I have no complaints! "Altaro is the BEST backup product for MSP's"
The product itself works perfectly. I've never only minor issues with it and when they've popped up I've been able to get them resolved quickly with the help of the support staff. I dislike that the software can not resume an interrupted off-site backup. If the off-site replication is interrupted, it needs to start from scratch. I am protecting over 50 virtual machines for my client's - all critical to their businesses continued operations. I've realized significant cost savings versus Datto and it's considerably easier to use and manage over Veeam. The Altaro Cloud Management Console makes it easy for us to manage our clients’ backups on their behalf. "Awesome backup software and easy to use"
No hefty requirements to run the software. Customer service and support is second to none and extremely responsive. Recovery times are way down. Especially with off site server boot from backup. Even in the worst case scenario, I can have the customers servers up and running remotely in 5 minutes. We are solving all of our backup and recovery, and also using it to transfer VM's to new hardware! Very easy backup, easy monitoring, simple license management. Deduplication and compression is one of the outstanding features - it saves up to 50% of disk space. For updates it is sometimes necessary to uninstall previous version. That's a little bit annoying. Altaro is a very reliable backup system. I had to restore several servers not a single one failed to do so! Altaro VM Backup is really easy and quick to install. After installed, very user friendly interface and simple wizard guides you through the backup and restore process. In case of trouble, support is quickly available and help you in a few minutes. A "wish to" is to have the Office 365 console integrated in the other. But I'm sure Altaro will done this. 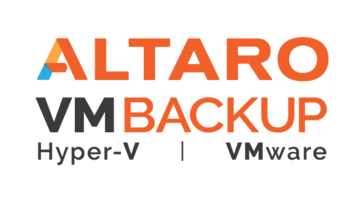 "Altaro VM Backup - Our number 1 choice"
Easy to Install, super fast to set up and simple to get to the reliable backup strategy you need for multiple onsite and offsite backups. We liked it so much we on-boarded all our clients to Altaro. Great extremely responsive support if required and a continued forward thinking development of their products make Altaro our first choice. We highly recommend it. Honestly - There is nothing to dislike. We have used several 'other' backup products and strategies and Altaro ticks all the boxes. The only business problem we had to overcome was the commercial cost for the alternatives out there in the marketplace. Compared to the competition, the decision was really easy to make. "Comprehensive, simple and effective backup solution"
We have been using Altaro VM Backup for a number of years now and have seen the product go from strength to strength. One of the best features is the simple approach that is taken with the software. From installation from first backup takes less than 15 minutes, no fuss, it just does the job and it does it well. There really is nothing that I dislike about the product. I would like to have seen CDP introduced in the Standard version of the product but I understand why that was not the case. Altaro VM Backup really does tick all of the boxes for us with the introduction of CDP and native backup to Azure blob storage. The product delivers a fantastic set of features at a great price point for our clients. "Altaro - backup & recovery made easy!" The boot from backup restore functionality is invaluable - using this we can bring a failed server back to life within a minute or so, minimising downtime for the customer. CBT allows us to continuously backup customer data where needed to ensure we meet strict RPO targets. v8 has introduced boot from offsite backup, so we can now restore our customers services in our datacentre if they have disaster. Backups are completed quickly, and the data is compressed considerably as to reduce network traffic (ideal for the offsite backups!). I wish Altaro would include support backup physical servers, direct restoration of SQL databases and SharePoint farms. We currently have to use a competitors product for those areas. Altaro offers a great feature set, and keeps going from strength to strength. With Altaro, we're able to monitor multiple installations easily. Saving time and money for both us and our clients. Using Altaro VM to backup multiple customers Hyper-V and VMWare virtual machines; love the central management console which lets me see the state of backups across all of our customers in one go. "Excellent backup solution for basic VM backup and restore for SMB/SMB+"
Very well documented, very GOOD Support! !, Backup and restore works perfectly, Easy setup, Easy use! Just try, and you will be covinced! Efficient Backup Setup, Full control of your backups. "Great Product, Pricing, Support and Development Cycle." - Very easy to use interface, fast installation and quick product setup. - Boot from backup gets you up and running in seconds! - CDP (Continuous Data Protection) allows us to protect VM's as often as every 5min. - Very lightweight Deduplication engine that is fast and efficient. - Offsite backup destination support with WAN optimisation, compression and deduplication. - Website access to backup status, push products updates, reports..etc (CMC - Cloud Management Console). - Large offsite backups to USB drives can take some time to update, however, it was not an issue as it runs after the primary backup location completes by default and believe the added time is mainly due to a 'check/scan process'. - Offsite copies of all backups to help protect from theft, fire, flood..etc..
- Offline copies of backups to protect from Ransomware and Cryptoware. "Very Good Experience from Altaro Hyper-V backup"
For price and use, Altaro is better than Veeam. I tested both products and my choice quickly decided. Veeam is better. Support at Veeam is very difficult whereas with Altaro you have a response very quickly. And the use is more intuitive, Veeam is really complicated and the standard version only allows backup locally, useless if the server crash. Backup on external hard drive or nas, fast and efficient (not included in the stranger version of veam). A bit difficult to use at the beginning (as all software for the first time) but the support is there and responds quickly to guide us. As for the restoration, it's very easy compared to Veeam, which is a gas plant and very difficult to understand. With Altaro you select the date whose seniority is important (I was able to go back to 6 months of backup on a hard disk of 2TB USB) and the restoration is done quickly and integrates directly into the Hyper-V taking soint of disable the network card to avoid IP confilts. "Easy to use cost effective VMware and Hyper- Backup"
It is easy to use and set up, has lots of options for restoring and redundancy, with boot from backup option. Updates are easy, customer service is great. Its affordable and effective. Is very cost effective method of managing your Virtual server backups in a small/medium sized business. Adds redundancy easy live backups while machine are still running. Can automate or manually take backups. Sand box restore and backup health check allow me to monitor and test the stability and reliability of my backups. Error reporting is available with access to live chat to help resolve issues. "A great, easy tool use that I couldn't live without"
It would be nice if Altaro would backup the host as well so another backup solution isn't needed for this. With our old backup solution we use to have to keep monitoring the backups as they would often fail, requiring us to spend time fixing it for it to only fail the next day. We have had Altaro for just under a year and have felt it to be much more reliable than the other solutions we have tried. We had an issue once however their support helped us on the spot though their live chat feature in the Altaro console. Many thanks for your review. We're glad to hear you enjoy using Altaro VM Backup! I wanted to let you know that we are working on also providing host backup. Up and running in 5-10 minutes. No need to chase prerequisites, setup databases or anything: we just ran setup and in 5 minutes we got list of our VMware and Hyper-V virtual machines ready to be added to backup plan. We have two offices in two cities, and now we can see what is happening with backups in both locations from one console, keeping track on every virtual machine and both internal and external backup storages we use. That's a true value in a few clicks from where you are right now! Only virtual machines are supported for backup - the world is still moving to a virtual/cloud and there will be years until it will be enough to backup only virtual machines. It is not critical dislike though, because critical part of infrastructure (databases, web-servers, version control systems, mailservers, etc.) are already virtualized. Try it yourself - will not take much time, most likely you will love product from first clicks. The main problem - is a risk of data loss. Altaro VM Backup closes that gap for us with guarantee in form of automatic copies verification/checking - it creates a straightforward trust in our relationship with software, we know for sure that in case of emergency, our virtual machines will return to service in no time. Thanks for your review. We appreciate your feedback. Our team is currently working on providing physical backup capabilities and we plan to release this in a few months' time. "Quick and easy and effortable"
Altaro is incredibly easy to use and has a fair license policy. Altaro backups virtual machines. It would be great to get this for physical machines, too. Just try it, you will understand it completely within seconds. The greatest benefit is the price in relation to the feature set. "High performance backup solution with affordable price"
The product has an intuitive interface easy to handle and high compression performance for an affordable price. The support is really excellent and fast! Nothing in particular except the lack of a physical backup feature. Solid backup solution for virtual servers, quick to install (first backup in few minutes), with advanced control and a cloud management console that making life easy. * We monitor all Altaro VM Backup reviews to prevent fraudulent reviews and keep review quality high. We do not post reviews by company employees or direct competitors. Validated reviews require the user to submit a screenshot of the product containing their user ID, in order to verify a user is an actual user of the product. Hi there! Are you looking to implement a solution like Altaro VM Backup?